Charlie and the Chocolate Factory is - on one level - a very simple morality tale about the importance of sacrifice, kindness, discipline and love and most students have either read it that way or seen it as such in the two fairly tortured film versions. However, if you read the novel again as an older student you can begin to see some of the more subtle messages that Roald Dahl was trying to get across. It is also a story that is rich in figurative language and vocabulary that make it a perfect format for reinforcing knowledge that we often reserve for either more complex books or for the interpretation of poetry. My purpose in creating this testing series was twofold: to offer up a series of tests that my fellow teachers could use for differentiation purposes, or one which I could use for my advanced students. I call it a “Taking It To A Higher Level" because the objective of the tests is to make students think harder about what they might dismiss as a fairly simple storyline. They also serve to reinforce all of the literary terminology we have taught our students and to provide those same students with a practical application for that knowledge. Hopefully, the examples that I provide you for each of these items indicated above will provide you with a clear idea of their quality and use. 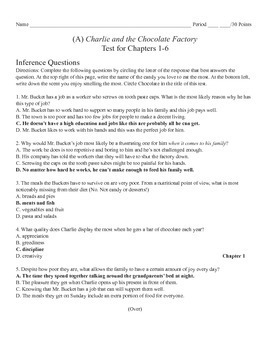 Each of the five tests (other than the first one) contain eleven inference questions that require the student to think more deeply behind the motivations and actions of the characters within the book. 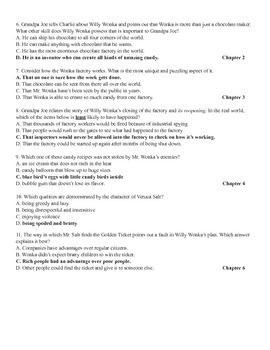 These questions are followed by eleven more that obligate the students to apply the literary terms they must know before they even begin the tests. Often this is terminology that is applied to the examination of poetry, but I thought students would appreciate utilizing their skills even more in a story they could relate to from their childhood rather than to poetry that doesn’t always resound with them. 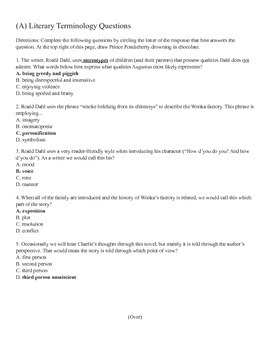 The final eleven questions are vocabulary-based inquiries where the students must establish the meaning of the word from the context of the sentence and paragraphs around them. I have separated literary terms and vocabulary pages from another because some of you might want students to work with source material and some of you might not. For myself, I don’t allow my students to go into the book to examine the text for literary terms questions, but I do allow them to use the novel for the vocabulary. The included literary terms, quizzes and tests are used as a basis for our advanced vocabulary program for sixth, seventh and eighth grade. It is equally beneficial for any high school class as either an introduction or a review unit. In my classes, all of the terms on the lists must be memorized before we begin any novel, poetry or short story work. The analogy I provide my students with is that it is much like fixing a car with another mechanic. You can’t begin to figure out the problem unless both of you agree on what the parts of the engine are named. For this reason each of the two groupings has a preparatory quiz to be followed by a test to confirm the students’ knowledge. The tests are much like the quizzes in that the students must be able to match up the definitions with their corresponding words, but the tests ask the students to provide the literary term to a sentence that completes the thought. Note that the quizzes also have hidden directions but the tests do not. As with any of my novel or short story tests, vocabulary questions are separated from the definitions questions to allow your students to use the literary terms source material or to deny them that usage. For my classes, I wanted a list of terms that could not only be applied when we were studying prose and poetry, but also when we are examining the writings of other; thus, you will see the Latin terms e.g. (exempli gratia), i.e. (id est), etc. (et cetera), et al (et alia) and [sic] (sic erat scriptum). Too often our students see these words but have no understanding of their meaning because teachers don’t receive the time to explain the concepts and apply them in exercises. I felt that with this list we should take the time and remedy the situation. Even more importantly, teachers don’t have the opportunity to point out how the students could be utilizing this knowledge in their own writing to better explain themselves to others. I’ve tried to include the most figurative language terms I could without bogging you down - or you students - with minutia. I wanted terms that you could use in classroom discussions without students having to constantly check their notes for understanding. Mind you, this does not come without a cost on their part. In our system the definitions to each word must be memorized - not exactly word for word - but enough so that students could complete the matching definitions to the correct word. More importantly, the tests ask the students to place the terms in their proper context when used in a sentence. To be able to do this they must either have their notes at hand or, be able to apply them from memorization (as my students are compelled to). It’s a choice that all teachers can make depending upon the students they are working with. In our system, the students are introduced to Literary Terms #1, then the first fifteen words of the group are assigned for memorization for homework. Knowledge of the final ten of the twenty-five terms are assigned for the next night. After each night’s commitment to memory, we orally review all of the terms with the students to check them for their knowledge. For the third day’s class we review all terms and notify the students of their preparation quiz on the fourth day. The purpose of the preparation quiz is to see how well the students know their terms before the test which follows the next day or the day after. If students perform poorly then they will know that they have to study harder before they take the test. The test definitions are the same type of matching questions as the quiz, but the test includes the sentence portion which tends to be more challenging. With the completion of Literary Terms #1, the following week repeats the cycle with the introduction of Literary Terms #2, homework preparation, oral review, quiz and test. I believe that teachers should do more to prevent cheating on any examination, so all of my tests and quizzes within this collection - as well as those that are a part of my short story exams on TeachersPayTeachers - have two versions. I hope you will find this beneficial. As with most of my tests and quizzes, there are directions hidden within the directions. Sometimes I include them to be playful, but I always include them to force students to read thoroughly and to take nothing for granted. For every direction that is not followed, my students lose a point from their exam. I find that if I do this often enough that I don’t have to do it very much thereafter. In the Teachers Pay Teachers system I must send all of this to you in Adobe format, but please don’t hesitate to write and request the Word version so that you can make whatever changes you would like in my format.